Berlin, October 3, 2016 — In a city revered for bold architectural wonders and soaring skylines, come November, a landmark 1929 Art Deco masterpiece will see a soulful revival befitting the Windy City. Perched high above the six corners of Damen, Milwaukee, and North Avenue, The Robey stands stoically as the only skyscraper for kilometers, stretching 61-meters tall and home to 69 guest rooms, Café Robey, a second-floor lounge, a guest-only rooftop lounge, and, come 2017, an exclusive rooftop pool. With the pedigree of Grupo Habita behind the project, so too comes a confident stroke of modern yet timeless hospitality. Taking its name from Robey Street—the north-south artery now known as Damen Avenue, where Wicker Park and Bucktown meet—The Robey captures the storied spirit of Chicago: a bustling, ever-changing, big-shouldered town. A unique triangular prism shape ensures that The Robey stands out as one of the neighborhood’s most recognizable landmarks. Although formally called the Northwest Tower, the building is nicknamed the Coyote Building due to its “howling” appearance, some say. Glass, natural wood, concrete, and chrome—the textures vary, but the minimalistic approach remains consistent throughout guestrooms and public spaces. Originally designed as an office building by the firm of Perkins, Chatten & Hammond, each of the hotel's light-filled rooms, lobby, and roof spaces were transformed by Belgian design duo Nicolas Schuybroek Architects and Marc Merckx Interiors. The 12-story building dons an Art Deco façade of original limestone and features a rooftop cupola and lantern, as originally designed by the Chicago-based firm. Thanks to the unusual triangular footprint of the building, front-row views of the lively city feature prominently, as does an abundance of natural light. Herringbone hardwood floors contrast with Art Deco references in many of the rooms and suites, while bathrooms and bedrooms are separated by walls of vintage chicken-wire glass. Furniture ranges from sleek and streamlined to inviting and contemporary, with minimalism reigning throughout. The 69 rooms are generously split across twelve floors, with only six or seven per floor. Rooms and suites range from 20 to 63 sqm, and all feature a shower and a king-size bed, apart from the 20-to 24 sqm Landmark Queen room that features a queen-size bed. The Corner and Panorama Suites and the Landmark Queen room also boast a sitting area, with the former two also playing host to a working desk. All rooms and suites also offer views of the Wicker Park and Bucktown neighborhoods, while The Panorama Suite affords 180-degree views of Chicago’s skyline. 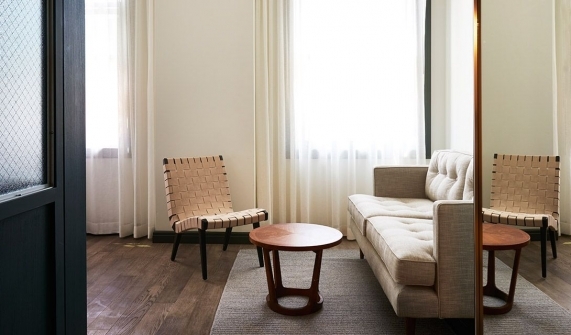 Sitting at the epicenter of Chicago's Wicker Park and Bucktown neighborhoods—a pair of arts and culture-obsessed communities—the hotel’s ethos follows suit with social sensibilities front and center. Communal spaces abound, showcasing terrazzo, natural woods, and hues of deep red, green, white, and gray. The ground floor Café Robey is helmed by chef Bradley Stellings whose inspired take on French-American has created a gathering place for guests and locals alike, set against the backdrop of Wicker Park and Bucktown's bustling six-corner intersection. Here, breakfast, lunch, and dinner (and brunch on weekends) is served in an industrial-tinged space under double height ceilings and surrounded by the streetscape of Milwaukee and North Avenues. The high and mighty will seek out the stunning, private 13th-floor rooftop lounge Up & Up where expansive, low-slung sofas line the indoor bar area. An equally alluring outdoor space invites late evening sundowners and nightcaps accompanied by The Robey's heavens-bound spire. Opening Spring 2017, The Robey’s crowning feature will be a rooftop pool, and the full-service restaurant Cabana Club, which will serve Greek-inspired favorites with glimpses of the ‘L’ train. The duo behind Grupo Habita has been bringing a design revolution to Mexico’s hospitality industry since 2000. Investment banker Moisés Micha and citrus farmer Carlos Couturier have built up a collection of over a dozen diverse, award-winning hotels across Mexico and more recently in the USA. The ideological pair excels at choosing untapped locations in Mexico where they can integrate their vision into the personality of the city. As they put it: “It’s about creating experiences for your guests and making the world better through hospitality.” The Robey is the second American flagship hotel from the group, after New York’s Hotel Americano, and will be followed by a third in L.A. come late 2017. Design Hotels™ represents and markets a curated selection of over 290 independent hotels in more than 50 countries across the globe. More than a collection of hotels, the company is a collection of stories. Each property reflects the ideas of a visionary hotelier, an "Original," someone with a passion for genuine hospitality, cultural authenticity, thought-provoking design and architecture. Each "Original" stands for the individual, aesthetic and service-driven experience that his or her hotel provides. press@designhotels.com / +49 30-8849 400 34.